Barnes TSX Bullet has earned a reputation as “the perfect hunting bullet.” Now, Barnes has improved on perfection by adding a streamlined polymer tip. The new "Tipped" TSX (TTSX) features the same 100-percent copper body with multiple rings cut into the shank. It delivers the same gnat’s-eyelash accuracy and “dead right there” performance—but with an added polymer tip that boosts BC and improves long-range ballistics. The tip and a re-engineered nose cavity provide even faster expansion. Complete penetration, virtually 100-percent weight retention and four razor-sharp cutting petals that double bullet diameter means the new Tipped TSX creates more internal damage than any competing bullet. 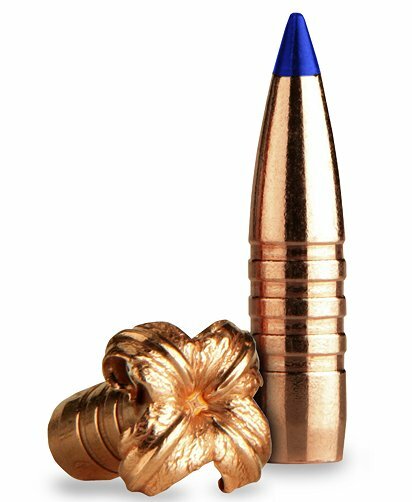 Instant expansion and perfect penetration ensures cleaner, quicker kills See an awesome video on our Barnes Bullets Home Page. *Flat Rate Bullets Only Shipping Terms: A USPS promotional FLAT CHARGE of $10 per shipment for bullets (Projectiles) only orders. Maximum 15 lbs mix and match per shipment. Out-of-stock and partially out-of-stock orders will be back-ordered, held, and shipped all together in one shipment as soon as we are re-stocked. (Split Ship of partial back orders is available at $10/shipment). More Info at our Flat Rate Bullets Page. Choose "$10 Bullets Only Shipping" at Checkout. Excellent product and excellent service from you. These bullets should be able to kill on looks alone. The bullets were all brilliant, no discoloration. Very easy to reload and are very accurate. Will definitely go all Barnes from now on.